Characteristics, Dating, Chronology of Arnhem Land Aboriginal Rock Paintings. Kakadu National Park, Arnhem Land. What is the World's Oldest Art? Ubirr Rock is a world-famous site of Aboriginal rock art, on the edge of the Nadab floodplain in the traditional lands of the Gagudju people. Ubirr (also known as "Obiri Rock") is the best-known site of Aboriginal prehistoric art in Kakadu National Park, Arnhem Land, in Australia's Northern Territory, although there are other rock-face galleries in the region, such as those at Nourlangie. Some of Ubirr's Stone Age art is believed to date to the era of Paleolithic art, perhaps as far back as 30,000 BCE or even earlier. However, as in the case of the Burrup Peninsula rock art, this is merely a general estimate, as no painting at Ubirr has actually been carbon-dated to such an early period. Indeed, the bulk of the artworks were almost certainly created during the later periods of Mesolithic Art (about 10,000-6,000 BCE) and Neolithic Art (about 6,000-2,000 BCE), and throughout the modern era. Hence the earliest art in Arnhem Land remains the Nawarla Gabarnmang charcoal drawing (c.26,000 BCE). There are a number of accessible galleries of cave painting at Ubirr, including the Main Gallery, housed underneath an overhanging rock, which has an outstanding assemblage of Aboriginal cave art (mainly "X-ray art"), and the sacred Rainbow Serpent Gallery. Aborigine artists painted a huge variety of images, depicting human figures and animals as well as scenes associated with the "Dreamtime". 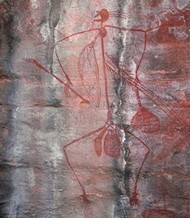 The stylistic chronology of Ubirr's rock art is the same as for all works within the Arnhem Land region. Works are classified into three main periods, based on the changing characteristics of the environment. These are: Pre-estuarine, Estuarine and Freshwater, of which the oldest art consists of prints of hands and other objects, created during the Pre-estuarine period, anywhere between 40,000 and 10,000 BCE. To see how Ubirr's aboriginal petroglyphs fit into the development of Stone Age art around the world, see: Prehistoric Art Timeline (from 2.5 million BCE). As mentioned above, the age of most Aboriginal art at Ubirr has not been scientifically confirmed by carbon dating. Instead, estimates have been made, based on the confirmed dates of human occupation of ancient rock shelters. For example, human occupation at Arnhem Land rock shelters Malakunanja II and Nauwalabila 1 has been carbon-dated to around 55,000 BCE. In addition, archeological evidence and carbon-dating reveals that by 50,000 BCE the earliest Aboriginals were already using colour pigments (high grade haematite, red and yellow ochre). (See also: Prehistoric Colour palette.) As a result some experts are convinced - especially after the recent Uranium/Thorium dating of Sulawesi Cave art (Indonesia) to 37,900 BCE - that this makes it likely that aboriginal art at Ubirr and other sites in Arnhem Land began around 30,000 BCE. After all, the oldest parietal art in Europe, which is believed to be created by the same species of human, is the El Castillo Cave paintings which date to about 39,000 BCE. Against this, is the fact that human habitation does not automatically lead to the creation of rock art; and neither does the use of colour pigments, which might be used for face painting or various forms of body painting. Even the recent discovery of a primitive charcoal drawing (carbon dated to 26,000 BCE) at the Nawarla Gabarnmang Rock Shelter is not supportive of this pigment-argument, although it does provide a marker for artistic capability. In short, like a lot of ancient art in Australia, we suspect that it might be extremely old, but we can't prove it. For more examples of contemporaneous art from Europe, see the Chauvet Cave paintings (c.30,000 BCE); Lascaux Cave Paintings (c.17,000 BCE) and Lion Man of Hohlenstein Stadel (38,000 BCE). During this period, which roughly corresponds to the Upper Paleolithic in Europe - sea-levels were much lower and the climate was more arid. Pre-estuarine Period art begins in primitive fashion before depicting different types of humans/tribes, their hunting habits, mode of dress, and aspects of spiritual life. It is represented by several styles: (1) positive prints of objects like hands, or inanimate materials - see also: Prehistoric Hand Stencils; [NOTE: For the finest examples of Aboriginal finger fluting, see: Koonalda Cave Art (18,000 BCE)]. (2) large naturalistic animals - typically drawn in outline and filled in with an ochre wash (including extinct megafauna like the thylacine, rock pythons, freshwater crocodiles, wallabies, Kangaroos) and humans; also features the earliest x-ray paintings (3) dynamic figures - small, intricate action-drawings of humans, as well as animal and anthropomorphic figures, typically human male figures are shown in headdresses and skirts, with necklaces and pendants, and armed with clubs, stone axes and barbed spears; (to compare these with the figurative works in Kimberley rock art, see Bradshaw paintings); (4) post-dynamic figures - like the dynamic figures but typically drawn in silhouette and without their animated character, although a new weapon - the pick/hooked stick - is introduced; (5) simple stick-like figures armed with hooked sticks and boomerangs; (6) so-called "Mountford figures" - human figures with elongated bodies, typically depicted running at top speed (running figures); and (7) yam figures - that is, with a yam-shaped head and an animal/human-shaped body, or a half-plant/ half-animal figure; first appearance of the "rainbow snake". This style also introduces some interesting abstract signs, such as segmented circle symbol. Note: To compare Ubirr rock art with that of Africa, see the animal pictures on the Apollo 11 Cave Stones (c.25,500 BCE). Note: For the oldest site of open air petroglyphs in Europe, please see: Coa Valley Engravings Portugal (22,000 BCE). This beginning of this period - corresponding with European Neolithic Art - is characterized by the flooding of river valleys and the formation of mangrove swamps. Estuarine Period art is represented by three styles: (1) early estuarine paintings of saltwater crocodiles, mullet, giant perch and catfish, as well as naturalistic human figures including a variety of spear throwers; (2) bees-wax art - featuring simply-drawn designs as well as fairly detailed arrangements of human figures, created in bees-wax obtained from local bees; (3) an ultra-realist X-ray style of drawing in which the internal anatomical structures of humans, animals and objects are shown, as well as their external shape. Animals, for instance, are depicted in profile, with their internal organs and skeletal structure clearly laid out. During this period, saltwater systems were replaced by freshwater pools (billabongs) and wetlands, creating new habitats for water birds and a whole new set of food resources for the area. Freshwater Period paintings reflect these ecological changes by depicting the new flora and fauna, as well as humans carrying goose spears and didgeridoos. The period is represented by two styles of art: (1) the X-ray decorative style - this was a continuation of the final type of Estuarine Period art: artists continued to subdivide their subjects internally, but only for decorative purposes. The "Lightning Man" makes his first appearance at this time. (2) Contact art - which depicts the arrival and behaviours of visitors from Offshore, Indonesian, Chinese and European cultures, and the effects of this on Aborigine society and lifestyle.  For more information about stonework, see: Megalithic Art.  For details of the arts of the South Pacific area, see: Oceanic Art.  For more about prehistoric rock carving, see: Venus Figurines.  For a guide to ancient plastic art, see: Prehistoric Sculpture.  For more about Aboriginal rock paintings at Ubirr, Australia, see: Homepage.